We took 3 horses to http://www.bissellwood.co.uk/ XC schooling today. At Bissell Wood the XC is all in woodland on sandy tracks so it stays good ground even after the all the rain we have had recently. Blizzard popped round really nicely, she’s very brave, she even cantered a few, although I jumped mostly from trot as she’s still green as it was her first ever schooling session. Sprout loved it too, he pinged feeling every bit the sports horse he is. I tried not to over correct him, the fences weren’t too big and I wanted him to make mistakes and learn from them while the fence were still small. He certainly learnt quickly, if he was too deep he didn’t touch a thing and if too long he jumped with great enthusiasm, he is very quick thinking and reacts fast too, he’s a real XC horse in the making. Rif Raf hadn’t been XC for a while and was keen to get going, once she was out on XC she settled into a lovely rhythm and jumped so nicely, it was good to ride one that wasn’t learning and already knew her job. Sprout has taken to stealing my bobble hat, so when he had removed it from my head for the third time in 5 minutes this morning I put it on his head. 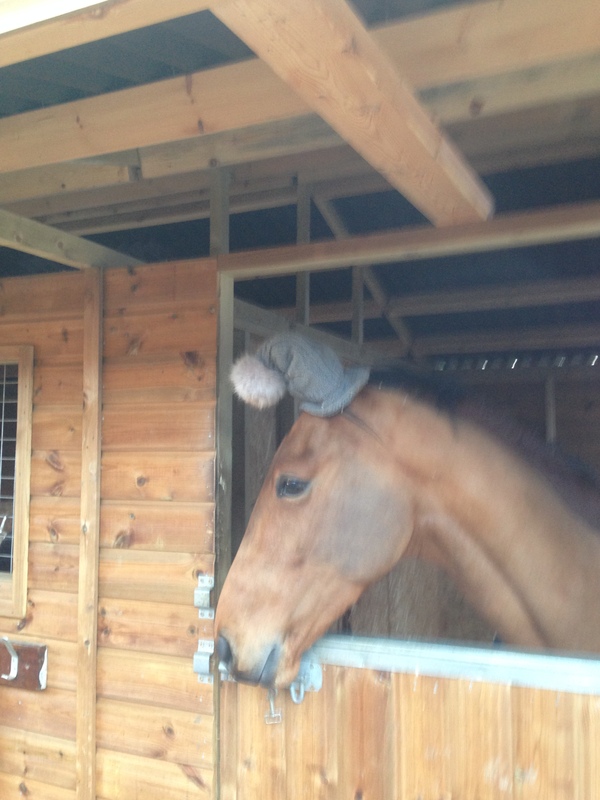 He was so funny and didn’t try to take it off, maybe he had cold ears!!! !